When Tom Muraco puts on an opera, you tend to show up out of FOMO. To miss one would leave you feeling cheated out of a predictably delightful experience. The operas are astutely chosen, the talented students are wisely cast, and the bare bones style of production allows one to focus on the music. In this case, we had an intense exposure to Mozart's masterpiece of romantic entanglement--Cosi fan tutte. Maestro Muraco himself conducted and the score for two pianos and harpsichord continuo (actually an electronic keyboard) was devised by the three keyboard artists themselves--Sungah Baek, Juan Lázaro, and Yixin Tan. The three did a great job and we were able to hear compositional elements that we missed when the work was presented with full orchestra. Actually, we think we heard more music. Could it be that some music that is generally cut was restored? Or did our ears deceive us? There is enough music in this opera for two operas! The students of Manhattan School of Music are as fond of Maestro Muraco as we are. We sat next to the podium as he conducted and can attest to the fact that he knows every word in the libretto and every note of the score. His love for music and for his students was equally obvious. As Don Alfonso, the older cynic who sets the crazy plot in motion, José Maldonado might have stolen the show, were the other artists not as fine as they were. His huge Falstaffian presence and voice, augmented by seemingly natural dramatic chops, created a real character. Every glance and wry smile, every barb carried weight. 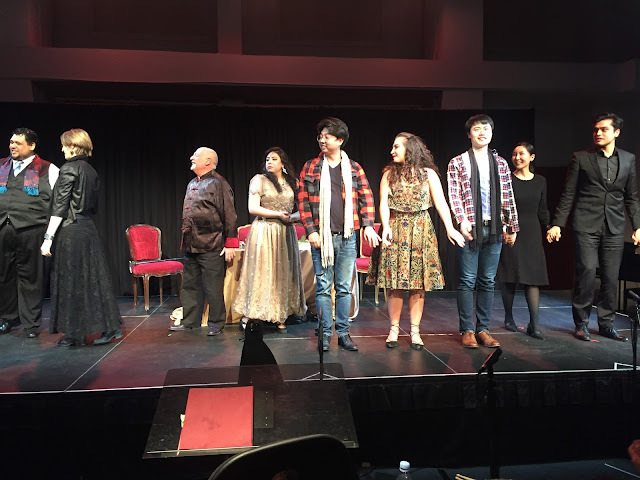 His partner in crime, the wily Despina was performed by soprano Yesul Yeon whose slender voice was well focused and whose comic chops matched those of Mr. Maldonado. Her featured aria "Una donna a quindici anni" was very well done. We loved the way she exaggerated the rolling of her "r"s.
Since the theme of Lorenzo da Ponte's libretto was fiancé swapping, the opera requires four engaging singers that we can care about, even while laughing at their puerility. As Fiordiligi we had the shining soprano Shaina Martinez who successfully negotiated the wild skips of "Come scoglio". Legend has it that Mozart wrote it thus to make the soprano he disliked bob her head like a chicken, due to the way she sang high and low notes! As her sister, we heard marvelous mezzo-soprano Polixeni Tziouvaras, who did herself credit in her aria "Smanie implacabili". Mozart made sure that each singer had an aria. Her voice harmonized beautifully with that of Ms. Martinez, especially in "Prenderó quel brunettino". Mozart made sure that there were also plenty of duets, trios, quartets, etc. Tenor WooYoung Yoon has a pleasant ringing tenor and created a fine Ferrando; we enjoyed his voice most in "Tradito, schernito"; he had some splendid duets with baritone Dongwei Shen who excelled as Guglielmo. His aria "Donne mie, la fate a tanti" was beautifully rendered in all of its angst. The voices of the two men blended as successfully as those of the women. One of our favorite ensemble pieces, "Soave sia il vento" was gorgeously sung by Mr. Maldonado, Ms. Martinez and Ms. Tziouvaras. We could not have been more pleased with the musical elements. But what about the production elements. As we indicated, this is a bare bones production and Director Victoria Crutchfield did well for the most part in the interactions among the singers. We loved the way the chorus (all excellent, by the way) moved the "furniture" (just a bench, a table, and some chairs) with Despina in charge, pounding the floor to summon the furniture movers for a scene change, which always seemed to involve lifting things over her head. Our only quibble was with a few anachronisms. Probably to avoid the cost of costuming, the action seems to have been moved to the present, what with the cell phones and contemporary clothing. So why did the women carry 18th c. parasols? The "Albanians" became "hipsters from Williamsburg and Tribeca". Anyone from New York would know that Tribeca is populated by very wealthy Wall Streeters. You'd be hard pressed to find a hipster there. Better to have used Bed-Stuy or Bushwick. For those of us who understand Italian, hearing one thing and seeing titles saying something else creates a momentary lapse of concentration and involvement. A "brunettino" is a man with dark hair, NOT a man in spectacles! These disjunctions are occurring more and more as operas are squeezed into time periods that do not fit. Minor criticisms aside, it was a fun evening and made us realize that we have more in common with the 18th c. Viennese than with the 19th c. audience which found this opera vulgar and scandalous. There will be a repeat performance on Sunday matinée with a different but presumably equally talented cast.